The 100 Best Green Companies rankings were calculated by Oregon Business research editor Brandon Sawyer and research partner Davis, Hibbitts & Midghall based on confidential employee surveys and a report completed by each company. The 100 Best Green Companies rankings were calculated by Oregon Business research editor Brandon Sawyer and research partner Davis, Hibbitts & Midghall based on confidential employee surveys and a report completed by each company. The green questions were asked during the 100 Best Companies survey last fall. It isn’t easy being green, but this year’s inaugural class of the 100 Best Green Companies to Work For in Oregon shows that if you’re committed to sustainable practices, it pays off not only for the environment and the bottom line, but also in being a great place to work. The 100 Best Green Companies were selected based on sustainable practices sections from the 100 Best survey process, completed by 372 employers last fall. Participation in the 100 Best survey is voluntary and free of charge. Companies had to employ at least 15 Oregon workers at the time of taking the survey. For the 2009 survey nearly 30,000 Oregon workers rated satisfaction and importance in five statements related to sustainable practices. Company representatives also answered 10 questions about their company’s sustainable business practices. Oregon companies rely on green seals and local support groups to show there's substance behind their sustainable business claims. Oregon's 100 Best Green Companies are blazing a variety of trails toward sustainability. The employee survey counts for half of a company’s score, out of a possible 100 points, with average employee satisfaction and importance ratings each representing 1/4 of the total. The employer benefits survey is also scored on a 100-point scale, accounting for the other half of the overall score, and resulting in a total possible score of 200. To be considered for the 100 Best Green Companies, employers must sign up for the general 100 Best Companies survey. 1. 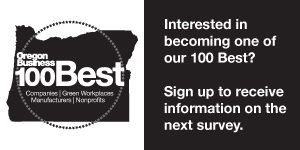 Eligibility: Any private or public company, nonprofit or government agency with at least 15 Oregon-based employees is eligible to enter the survey. The company itself may be head- quartered outside the state. 2. Survey period: The process for 2010’s list will begin in August and end in October 2009. There is no charge to participate, and organizations that do not make the list will remain anonymous. All participants that complete the process can obtain survey results. 46 CB Richard Ellis cbre.com Portland 174.76 Commercial real estate sales, leasing and property mng.